When it comes to my skincare routine I usually tend to stick to the same things that I know my dry and sensitive skin enjoy. During the winter months when the holidays are in full swing, I tend to gravitate to more favorite drugstore products to help out with my holiday budgeting - And I have no complaints with the products I've chosen. Here are my 5 Tips for Winter Skincare for Under $20. Enjoy! I feel like this should be a Tip that's common knowledge but it's really surprising to me that a lot of people don't know how great water is for your skin. I used to be one of those in-the-dark people so hang in there. Colder climates tend to dry the skin out, which if you have already dry skin like I do, you despise this. I always tell people "The Best Moisturizer for your Skin is H20," and I get some funny looks. But it's true, the best thing you can do for your skin is chug, chug, chug! When skin is hydrated and has elasticity, it's less likely to crack and let in unwanted particles that cause irritation. I have two different cleansers that I switch between during the cold, winter months. When I'm just doing my normal wash and rinse I use Cetaphil, which is still $6.59, and keeps you under that $20 goal. About once or twice a week I like to exfoliate. I don't like a super rough exfoliant because of my sensitive skin, but I like microbeads that work enough to scrub the dry, dead skin off. And that's why I use my Neutrogena Oil-Free Acne Wash (Pink Grapfruit. I love the pink grapefruit line. The acne wash offers grapefruit extract, vitamin c, and microbeads which will help keep your skin healthy, glowing, and "smooth away roughness without causing redness or irritation." (as stated on neutrogena website). During the winter I think we all deal with dry, chapped lips more than anything. And I can say this because I'm currently sitting here lathering up my lips with lip balm because they hurt so badly. When I do my face exfoliant two times a week, I like to exfoliate my lips as well. Coconut Oil and Sugar are two easy substitutes for this step, but I also like to keep my E.L.F Lip Exfoliator on hand. I mean, $3 for a killer product? What a Steal! This product is infused with all kinds of nutrients, vitamins, and oils that keep your lips healthy: Vitamin E, Shea Butter, Avocado, Grape Seed, and Jojoba Oils - all to keep your lips nourished! Just like you add moisturizer to your skin after exfoliating, do the same with your lips. I like to switch between good old Coconut Oil and my favorite moisturizing lip balm/chapstick. I have a drawer dedicated to lip balms and chopsticks, but which it comes down to it, Burt Bee's Replenishing Pomegranate Lip Balm is my tried and true. The Pomegranate Oil nourishes your lips with antioxidants and keeps your lips moist throughout the day. When I feel my lips getting dry I make sure to add some chapstick right away instead of licking your lips. Did you know licking your lips causes more irritation and dryness? It's true. Lip smacking is the worst thing you can do for your dry lips, you also have more of a chance to get cold sores and your lips splitting. 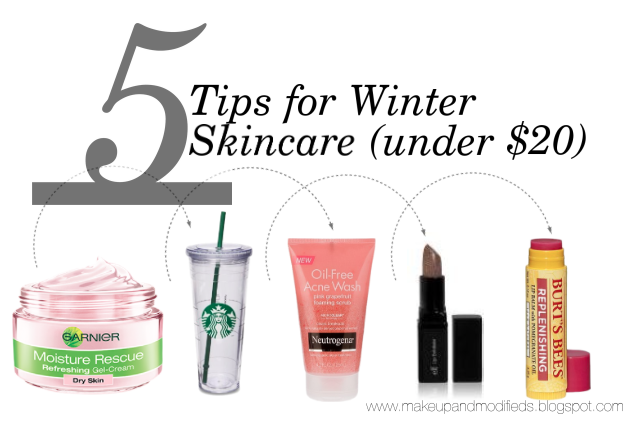 And there you have it, my 5 Tips to Winter Skincare under $20. I am a total believe that you can achieve flawless skin on a budget and these are just 5 of my favorite ways of doing that. I hope you all keep your skin/lips healthy and moisturized this cold winter season. Just remember - if you're not hydrated, your skin won't be. What are some of your favorite under $20 skincare products? "Kick off your boots, Grab a Cold Drink, and Stay a While"